I used to be addicted to reality TV. I wouldn’t dare to miss an episode of Jerseylicious, Big Rich Texas, or Keeping up With the Kardashians. If I wasn’t going to be home when one of these shows aired I would simply DVR it and catch up after I put the kids to bed. When I moved out of my Dad’s house and into my trailer I had every intention of getting cable (well technically, satellite TV) installed but I kept procrastinating. I had so much on my mind and my plate that TV was really the last of my concerns. After putting off getting the satellite put up for a couple of weeks, my reality TV withdrawals were pretty much nonexistent. My kids didn’t really notice too much either. Do you know what happens when you don’t have cable TV? Two words: increased productivity. As long as the weather permits, my kids and I now spend every evening outside. We take walks, play on the swing set, go fishing, and visit family. When we go inside the kids will play with their toys and I will clean up the house or fix them something for dinner. The only time the television gets any use from us is at bed time when I allow the girls to pick a DVD to watch. They have a collection of about 15-20 DVD’s that they watch repeatedly and never seem to tire of. When they lay down I turn on the laptop and work on one of my projects. If I had cable I probably would put a lot less effort into trying to make extra money. I did have a friend DVR American Idol for me this year, but other than that I don’t watch any TV. It has done wonders for my productivity and probably my IQ as well. 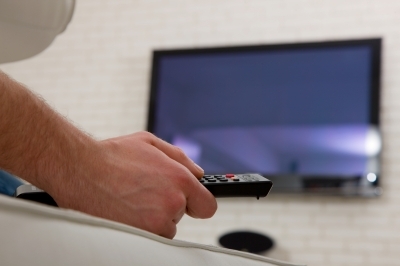 Here are just a few highlights of why forgoing cable TV might benefit you. More time to keep up with household duties. More time to enjoy a hobby. As a former reality show addict, take it from me, you can go without cable TV if that is something you want to do. The money you save is an added benefit but the real gain is the giant increase in productivity that you will get. How about you? TV or no TV? We haven’t had cable for nearly a year now, and honestly don’t miss it. We do watch way too much TV in the winter, simply because it’s SO cold here, but like you, when weather permits the TV is generally off. There’s too much other fun stuff to do! I haven’t had it for about 6 months now. I don’t even notice not having it. I thought I would never be able to live without cable. I was *completely* wrong. We love having our TV and all of the channels. Our price isn’t too bad at $50 for tons of channels and Showtime and HBO included. We do watch A LOT of TV though. I’ve been cable free for 2 years now, and I’ve found more time for books and exercise. It’s done wonders for my purse strings, and I find I don’t really miss it since I can check out shows from the library anyway. I read a lot too. If I don’t feel like writing or working on a blog I grab a book. It’s a lot easier to concentrate without the tv blaring in the background. I’ve never had cable tv in my life. I thought I was deprived when I was growing up, but now I realized that there’s so much to do and TV consumes so much of my time. Plus, there is plenty to watch on regular TV and on the internet that I don’t feel like I’m missing out. Your parents did you a favor by not having cable 😉 My kids get so much more exercise and learning time than they did when they were stuck in front of the TV all day. We’re like Michelle and have HBO as well. We run a really tight ship budget wise and this is one of the things we allow ourselves. That said, it can be easy to allow TV to eat up too much time and curb productivity. When we have it on at night at least one of, if not both, of us is busy working. We generally watch maybe an hour at the end of the day to unwind. I don’t hold any judgment against people who do have cable. If that helps you unwind that’s great for you. For me, my productivity has increased and my kids have been more active since there is no tv in the background distracting us. I’m on the fence with this one. My cable, landline, and internet are all one package. To get rid of the landline is $15 a month, and the cable/internet cost me an additional $70 then there are taxes. One of my goals this year was to ditch the cable, but if I’m only going to save $10 a month, not sure if its worth it…. I don’t even have a TV set 🙂 For about 3-4 years now. Life has become so much better ever since. If you want be learn the news there is the Internet, if you want to watch a movie there is again, the PC or even better the Cinema theater, and I do not play games. I haven’t had a television set for about 18 mos. When we moved in to our current place there just wasn’t room for it. I miss it about once a month or less. Usually, when I am really tired and want to just lay on the couch and zone out. Not having the kids seeing a lot of dumb commercials is nice too. I need to cut back again on bills. I’m looking at ditching the internet. I know that would be a big adjustment. I don’t have cable either. What I’ve found is that I have A LOT more free time to do productive things. I also have a lot less negativity in my life since I also watched a lot of crappy reality television (like the Real Housewives_. We still have cable although we haven’t turned the TV on and actually watched anything in almost a year. I know, I’m wasting money. But, it’s only $5 a month to keep the basic cable package because if I cancel cable, my internet jumps up to almost the same amount as internet + basic cable. Which is ridiculous, as I’ve pointed out to the provider already. The kids watch a few shows on the iPad occasionally, but for the most part, we are doing other stuff. Living without TV isn’t a big deal at all. Whenever I get home after a long day I have the option to watch some TV, or blog and work on money making ventures. The siren call of the TV is strong, so I hope to someday drop it like you have. Congrats! I thought my husband and son would have a fit when I got rid of our cable last year. Netflix solved that issue for my son and my hubby likes watching regular old free TV. I never was a TV addict so it never affected me. I’m neither mom, nor dad, just a dude who cut the cord a while ago. I do watch TV still, but all content is streamed and most of it is commercial free. I never did have an appetite for junk TV. I was over 30 before I ever owned a TV, and over 40 before I ever subscribed to cable. Cable TV is truly addictive, because so much is like sugary snacks. Streaming TV, if you choose it wisely, is less so.